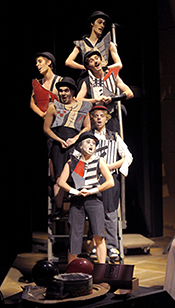 The Threepenny Opera continues at the Phoenix Theatre until November 21. With the incredible reviews pouring in from the media, tickets are going fast! Here are some tips for the best nights for the best seats. The best nights for the best seats are on Tuesdays and Wednesdays: TONIGHT & TOMORROW! Nov. 10 and Nov. 11 as well as next week Nov. 17 and Nov. 18. Thursday Nov. 19 has good seating available still. Weekends are pretty full with only a few seats available each night. Call soon or they will be gone! Saturday matinee, Nov. 21 is SOLD OUT! Ask the box office about standby tickets for the possibility of last minute admission to shows that are sold out. 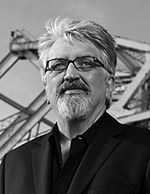 Click below to listen online to faculty member and director Brian Richmond talk about the seven steps in the process of developing his vision for this production. The Thereepenny Opera is "stellar," "an extravagant spectacle" and "a visual feast"
"The Threepenny Opera, a famously influential “play with music,” is now a grandfatherly 87 years old. Yet Bertolt Brecht and Kurt Weill’s subversive romp remains as potent and topical as ever — as a visually striking new production at the University of Victoria reminds us. ... it’s a real testament to the design crew (especially costumer Jacqueline Gilchrist) that this show looks so terrific. The beggars, bandits and whores wear wonderful outfits of red, black and white. Cost-cutting plastic and cardboard loom large in these costumes — and they look stunning." ... a highlight is the Cannon Song for MacHeath and the police chief, an exaggerated, high-stepping affair that eventually pulls in the entire cast... There’s plenty of worthwhile singing throughout. 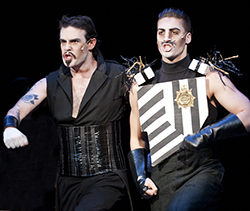 Dressed in a shiny black corset, Lindsay Robinson — a tall, handsome actor with a commanding stage presence — impressed as MacHeath. 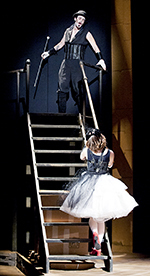 Another vocal standout... was Pascal Lamothe-Kipnes as Polly, sporting a series of spectacular chiffon-style skirts... As the police chief, Aidan Correia is a fine foil to MacHeath. And Estee Klue is a powerful, unrepentant Jenny. Director Brian Richmond keeps the cast hopping...There’s good attention to detail; even bit-role performers create distinct personas through movement and gesture." "The Threepenny Opera ... is an extravagant spectacle, with minute attention to detail where every design choice is in service to advance the aesthetic of the show. ... one cannot help but be captivated by the wacky enthusiasm of the costumes (Jacqueline Gilchrist performs wonders with cardboard) and the robust nature of the choreography (Jacques Lemay), particularly in the ensemble scenes with henchmen who cavort and gambol in exaggerated fashion, and ladies of the night who simper with overt advances. Robinson is a large man who moves with the lithe grace of a dancer or courtier ... it’s easy to imagine a rather sheltered Polly Peachum (Pascal Lamothe-Kipnes) falling head over heels for his charm and sophistication mixed with a disarming measure of danger. “What keeps a man alive?”... is definitely a show-stopper with its energetic movement and brilliantly mordant and perpetually pertinent lyrics. The ensemble... inject humour and fear throughout in equal measure—a most destabilizing effect guaranteed to elicit sympathy and provoke revulsion simultaneously. This Threepenny Opera, under Richmond’s careful guidance, is a startlingly artistic cautionary tale—one guaranteed to send theatre-goers away with as many questions as answers, thankful for theatre departments that allow for large casts capable of telling epic stories." From the Droog-like appearance of Macheath’s thieves to the raunchy plastic wrap, cardboard and duct tape covering the prostitutes, costuming and make-up are extremely effective, highlighted by a wildly funny Queen Charlotte in the finale. Brian Richmond, cast and crew have delivered up a wonderful opportunity to experience Brecht and Weill at their very best; accessible, entertaining and strikingly relevant." Due to scheduling conflict, Monica Prendergast was not able to review The Threepeny Opera on opening night. Her review will be part of the Monday November 16 program of On the Island. Be sure to listen in! PHOTO CREDITS: Photos by David Lowes, Art Studio 21.